Researchers have discovered a quasar known as SDSS J1106+1939 with the most energetic outflow ever, a finding that may answer questions about how the mass of a galaxy is linked to its central black hole mass and why there are so few large galaxies in the universe. The rate that energy is carried away by the huge mass of material ejected is equivalent to two trillion times the power output of the sun. The black hole at the heart of quasar SDSS J1106-1939 is massive, estimated to be a thousand times heavier than the black hole in the Milky Way. "This is about 100 times higher than the total power output of the Milky Way galaxy — it's a real monster outflow," said Nahum Arav, an associate professor of physics in College of Science at Virginia Tech and leader of the research team, which includes Benoit Borguet, now a postdoctoral researcher now at the University of Liege, Belgium; Doug Edmonds and Carter Chamberlain, both graduate research assistants at Virginia Tech, and Chris Benn, a collaborator who works with the Isaac Newton Group of Telescopes in Spain. Researchers studied the quasar in great detail using the European Southern Observatory's Very Large Telescope in Paranal, Chile – the world's most advanced visible-light astronomical observatory, and found the most energetic quasar outflow ever discovered. The findings were released today (Wednesday, Nov. 28, 2012) by the European Southern Observatory. "For the last 15 years many theorists have said that if there were such powerful outflows it would help answer many questions on the formation of galaxies, on the behavior of black holes, and on the enrichment of the intergalactic medium with elements other than hydrogen and helium," Arav said. "This discovery means we can better explain the formation of galaxies. There are hundreds of people doing the theoretical side of the work. They hypothesize outflows in their simulations, and now we've found an outflow in the magnitude that has only been theorized in the past. Now they can refine their already impressive models and base them on empirical data." The quasar's outflow is at least five times more powerful than the previous record holder, also discovered by Arav and his research group in 2009, and material from the outflow is inferred to be about a thousand light years away from the black hole at the heart of quasar SDSS J1106-1939. Every year, according to the team's analysis, a mass of more than 400 times that of the sun is streaming away from the quasar at a speed of 8,000 kilometers per second. *"I've been looking for something like this for a decade," Arav said, "so it's thrilling to finally find one of the monster outflows that have been predicted." Research done in 2010 using precise measurements on the light from distant quasars suggested that the value of the fine-structure constant may have changed over the history of the universe. If the quasar results are ever confirmed, our concepts of space and time are sure to change our fundamental understanding of the universe. The fine-structure constant, or alpha, is the coupling constant for the electromagnetic force. If alpha were just 4% bigger or smaller than it is, stars wouldn't be able to make carbon and oxygen, which would have made it impossible for life as we know it in our universe to exist. A 2010 study shows that alpha seems to have varied a tiny bit in different directions of the universe billions of years ago, being slightly smaller in the northern hemisphere and slightly larger in the southern hemisphere. One intriguing implication is that the fine-structure constant is continuously varying in space, and seems fine-tuned for life in our neighborhood of the universe. The physicists, John Webb from the University of New South Wales and his coauthors, used data from two telescopes to uncover the spatial dependence of the fine-structure constant. Using the north-facing Keck telescope in Mauna Kea, Hawaii, and the south-facing Very Large Telescope (VLT) in Paranal, Chile, the researchers observed more than 100 quasars, which are extremely luminous and distant galaxies that are powered by massive black holes at their centers. By combining the data from the two telescopes that look in opposite directions, the researchers found that, 10 billion years ago, alpha seems to have been larger by about one part in 100,000 in the southern direction and smaller by one part in 100,000 in the northern direction. The data for this “dipole” model of alpha has a statistical significance of about 4.1 sigma, meaning that that there is only a one in 15,000 chance that it is a random event. Quasars are highly luminous objects that emit light over a wide range of wavelengths, with peaks at several wavelengths due to emission by elements such as hydrogen, nitrogen, silicon, carbon and iron in the gas around the quasar. When light from the quasar passes near a galaxy on its way to Earth, the gas around the galaxy causes a distinct pattern of absorption lines in the quasar spectrum. By measuring the wavelengths of the absorption lines due to heavy elementswe can determine both the redshift of the gas and the value of the fine-structure constant, alpha, at the time when the light from the quasar was absorbed. Such observations suggest that the value of alpha was slightly smaller billions of years ago. Quasars are compact but highly luminous objects -so luminous that they can be studied in intricate detail using ground-based telescopes despite being vast distancesaway from us. We think that quasars contain blackholes at their centres and that the immense gravitational force exerted by the black hole is extremely efficient at converting matter in its vicinity into light. Since quasars are found in all directions in the sky, they provide a powerful way of charting almost the entire universe. 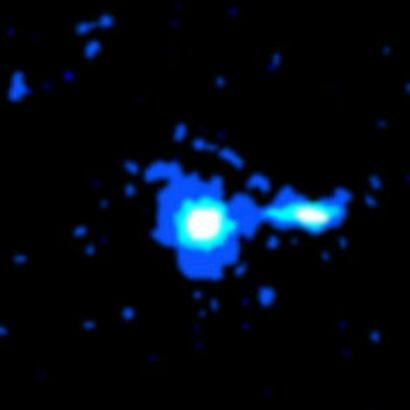 Some quasars are so far away that we see them as they were billions of years ago. Indeed, by observing quasars scientists can chart a continuous “universal history” that starts when the universe was only about one billion years old and continues up to the present day. Scientists cannot study alpha with any reasonable precision using the quasars themselves. Rather, they must examine what happens when the radiation from a quasar passes through a galaxy that lies between the Earth and the quasar.The quasar emits light over a broad range of wavelengths.However, when this light passes through the gas around the galaxy,a characteristic pattern of absorption lines, or "bar code," will be superimposed on it. The presence of an absorption line at a particular wavelength reveals that a specific element is present in the gas cloud, and the width of each line shows the quantity of the element that is present. In addition to hydrogen, which is ubiquitous in the universe, these “bar codes” reveal that the gas clouds contain a range of other elements, including magnesium, iron, zinc, silicon, aluminium and chromium. Moreover, the bar code reveals what was happening when the light passed through the cloud, which could have happened as long ago as just one billion years after the Big Bang. Although the gas cloud would have evolved into something quite different by today, its bar code provides us with a permanent imprint of its state in the distant past – including information about the value of alpha at that time. By comparing the bar codes found in quasar absorption spectra with the bar codes we measure for the same atoms and ions in the laboratory, Webb and team could find out if the physics responsible for the absorption of radiation by atoms has changed over the history of the universe. In other words, they can find out if alpha has changed. Confirmation that alpha is changing would have profound implications for physics. For instance, the equivalence principle – one of the cornerstones of relativity theory– states that in freely falling reference frames, the outcome of any non-gravitational experiment is independent of when and where it is carried out. Changes in the value of alpha would constitute a violation of this principle. The varying speed of light (VSL) theories, first proposed by John Moffat of the University of Toronto and developed in recent years by João Magueijo of Imperial College, John Barrow and others as an alternative to inflationary models in cosmology, could also lead to changes in the value of alpha in the early universe. Inflation and VSL theories attempt to explain features of the universe – such as its apparent flatness– that cannot be explained by the Big Bang theory alone.